The body of Brazilian-American artist Juliana Cerqueira Leite is both the instrument and the subject of her work. The work V is a latex mass in which only the imprints of hands, feet and several odd protrusions remind one of the human instrument. 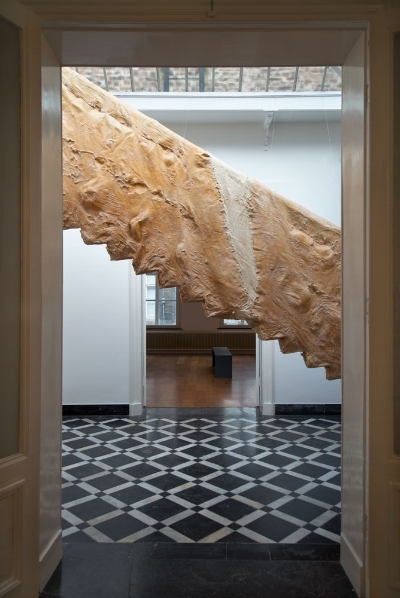 The latex was painted into a large mold, consisting of a staircase covered in layers of clay encapsulated in a wooden tunnel. A cast was made after the artist had walked up and down the staircase through the clay. The inverted cast is presented at Marres. 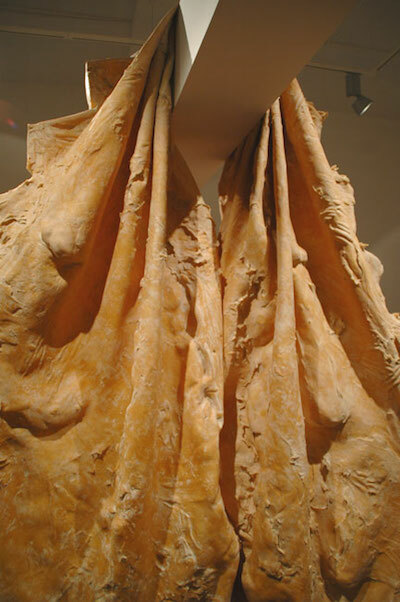 The result is a sculpture that very clearly incorporates the traces of a body. The work is somewhat paradoxical: movements that are usually ephemeral and intangible are captured in this sculpture. Leite is interested in the effect of her body’s physical action on (sculptural) materials. Through her method she always leaves something personal behind, giving the impression that she herself still inhabits the work. In this way the artist not only explores the space with her body, but also plays with the definitions of the self-portrait.